Dread is one of the most ghastly of emotions, due to it being not only debilitating, but persistent. Unlike fury, arrogance, or maybe even jealously, dread lingers. It feels like it has no end in sight. It's like being hunted by a Weeping Angel. The dread in this case is of the more trivial kind, but still significant enough to worry any athletics fan, as the World Athletics Championships have just begun. The main event of the competition - as is often the case - is the men's 100 metres, with the final taking place on Sunday. Barring something calamitous, the race will be a showdown between the best, and the best this year: Usain Bolt vs. Justin Gatlin. But there will be more at stake than just sprinting supremacy in the Bird's Nest Stadium. When the athletes lined up for the 100 metres final back at the 2012 Olympics. I had a nagging and unshakable feeling in my gut. Gatlin was Lane 6, Bolt in Lane 7. 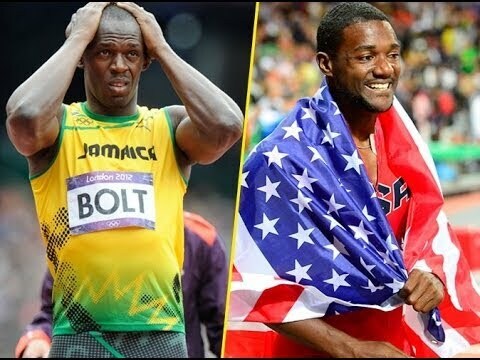 "What if Gatlin wins? I know Usain's there, but what if Gatlin wins?" The reason for Gatlin inducing such nausea is that he's been caught taking performance enhancing drugs. While that hardly puts him in a minority, not many have been caught doing so twice, and yet are still being permitted to compete, remaining unrepentant, absolving himself of accountability, and taking a "haters gonna hate" approach to anyone who has a problem with him being in the sport. Bolt, meanwhile is the "Shawn Michaels" of track and field. To steal Michaels numerous monikers, Bolt truly is the headliner; the icon; the main event; the showstopper. And like Michaels, he's seldom outperformed on the big stage. In London, Bolt caused me - and many others - to exhale in relief as he powered home to retain his Olympic title. However, it shouldn't be forgotten that for about half that race, Gatlin was leading. Although ultimately, the nightmare of a previous and unrepentant drugs cheat winning the blue riband event of the Olympics was prevented. But that nightmare may not be eradicated, only deferred. Just because Gatlin was beaten in London, he didn't go away. He's determined to regain his place as the world's premier sprinter, a position he once held in that interstitial between the dominance of Maurice Greene, and the arrival of Bolt. He'll go to Beijing as the warranted favourite to win gold. He's consistently run fearsome times this year (six of the seven quickest so far in 2015), and even Bolt's intimidatory aura is less of a factor as Gatlin has experience of beating Bolt in the past. While the Jamaican ran an encouraging 9.87 in London last month, he's goes to Beijing carrying little more than his awesome reputation, and a return to the scene where he became sport's supernova, rather than the bank of fast times that Gatlin arrives with. Athletics is in the midst of a torrent of suspicion that the sport is institutionally rife with drugs cheats, and Gatlin would be their lodestar if he crosses the line first. The last thing track and field needs is for him to be the face of the sport. Another Bolt success wouldn't cure athletics of its problems, but his achievements are one of the few things giving it credibility. He's been the welcoming concierge in a hotel that has damp in the ceiling. But as figurative concierge's go, there's been none better. Bolt vanquished Gatlin in London. He bested him in Moscow in 2013. But the American has been creeping ever closer. Gatlin cares not for the love of the public. He cares only about winning. That nagging feeling is back, and I fear it will metastasise into a gold medal for Gatlin. So far 2015 has been a year for sport's villains: Floyd Mayweather; Luis Suarez; the New England Patriots. Don't be surprised if Gatlin is next. - Shawn who? Arguably the finest professional wrestler who ever lived.